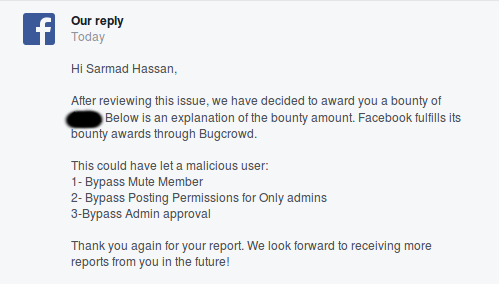 The story began when Facebook Security Team announced their Facebook June Whitehat Promotion in June 1, 2018, they said they will take only two researchers to join Defcon in Vegas for free for BEST QUALITY REPORT and HIGHEST REWARD VALUE. It’s a new feature in Facebook groups that allows Group admins even normal members to pick any public video on Facebook and show it to other members at the same time with a dedicated comment reel to create a “shared viewing experience”, for more Details. I Switched back to the first test group from Sarmad Hassan Account and made watch party post and changed the group_id to the victim group ID (Noobs) and boom, it works so even if the admin of victim group muted the attacker he still be able to make watch party video and Bypass mute option. 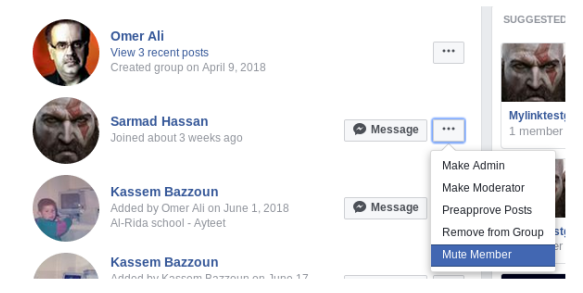 and will be able to watch this video and invite all group members to see it, so Imagine with all these protections that made by the admin of victim group (Noobs), the attacker Sarmad Hassan Bypassed it ALL :), Imagine if you’re an Admin of group and you checked all the above settings to make sure no one can post in your group except you and you feels so happy, But someone actually can bypass that and make a post without your approval, what will you think!!! Also congratulations for the Winners SASAE and Pranav Meghsham for winning Facebook June Whitehat Promotion.